Monday November 11th 1895 It was fine day. I worked on the wristlets to match my knit jacket in the forenoon. I worked out in the yard all afternoon. Will killed a hog in the forenoon and was down town awhile in the afternoon. Tuesday November 12th 1895. I worked with the meat and lard till about two oclock. I then worked in the yard till time to get supper. Will was down in the field in the forenoon and went to the Westen house sale in the afternoon. 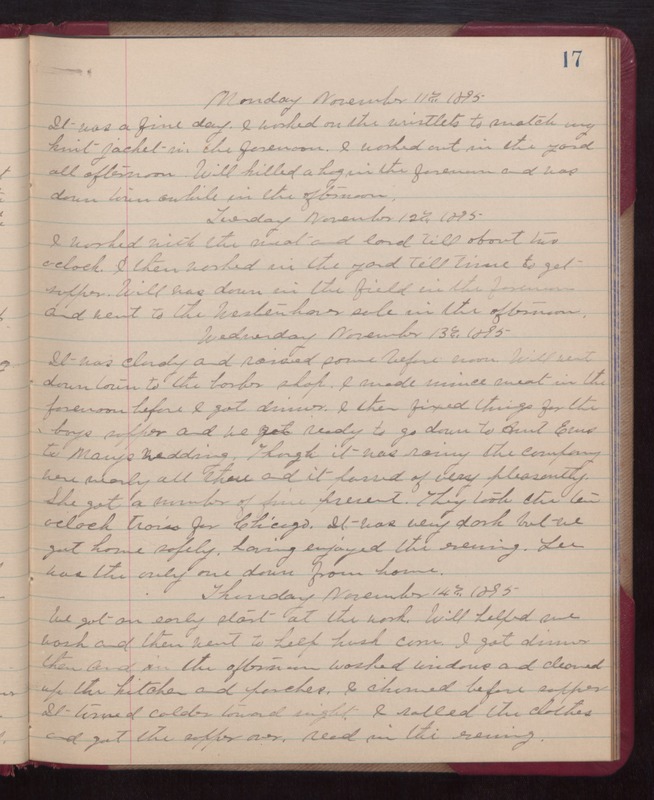 Wednesday November 13th 1895 It was cloudy and rained some before noon. Will went down town to the barber shop. I made mince meat in the forenoon before I got dinner. I then fixed things for the boys supper and we got ready to go down to Aunt Ems to Marys wedding. Though it was rainy the company were nearly all there and it passed of very pleasantly. She got a number of fine presents. They took the ten oclock train for Chicago. It was very dark but we got home safely having enjoyed the evening. Lee was the only one down from home. Thursday November 14th 1895 We got an early start at the work. Will helped me wash and then went to help husk corn. I got dinner then and in the afternoon washed windows and cleaned up the kitchen and porches. I churned before supper. It turned colder toward night. I rolled the clothes and got the supper over. read in the evening.